Caritas supports the Global Campaign to End Immigration Detention of Children. 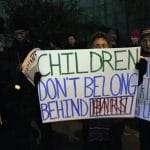 Leeanne Torpey, from the International Detention Coalition, explains in a guest blog why the world has to protect children who are imprisoned for no other reason than they are migrants. This blog featured on the Caritas website in English and Spanish. Millions of children are on the move around the world. As a result the impact of child migration are found in every country. Detaining children and families based simply upon their irregular migration status is extremely damaging. Despite that every day, thousands of children are locked up in criminal-like settings even though they have committed no crime, the issue of child immigration detention is still relatively invisible. Many citizens simply do not realise that it is happening in their own countries. But the reality is that millions of children are spending a significant amount of their childhood behind bars simply because they have migrated. Many migrant children in detention are separated from their parents or families. Almost all face limited access to health services, education and play. Children in immigration detention face an extraordinary amount of stress. There is clear evidence that detention profoundly harms children’s physical, mental and developmental health. Clearly, detention is no place for a child. The Global Campaign to End Immigration Detention of Children was launched in 2012 at the United Nations Human Rights Council, with simultaneous launches around the world. Today, over 100 organisations have endorsed the campaign, including the Office of the UN High Commissioner for Human Rights (OHCHR), the UN High Commissioner for Refugees (UNHCR), the United Nations International Children’s Emergency Fund (UNICEF) and NGOs such as Human Rights Watch, Amnesty International and faith-based groups like Caritas Internationalis. The campaign was launched by the International Detention Coalition (IDC), which is a unique global network of over 300 civil society organisations and individuals in more than 70 countries that advocate for, research and provide direct services to refugees, asylum seekers and migrants affected by immigration detention. The campaign aims to convince political leaders that children should not be in detention based upon their or their parents’ immigration status and urges governments to undertake legal, policy and practical action to end child immigration detention as a matter of achievable priority. Based on the findings of a global study looking at children in the context of migration, entitled ‘Captured Childhood’, the Global Campaign to End Immigration Detention of Children adopted the following core position that all child migrants should be free, treated as children, looked after, able to live in the community and able to live with their families. There are campaign activities planned in over 20 countries later this year as we look forward to celebrating the 25th anniversary of the UN Convention on the Rights of the Child (CRC). Children should not be criminalized or subject to punitive measures because of their or their parents’ migration status. The detention of a child because of their or their parent’s migration status constitutes a child rights violation and always contravenes the principle of the best interests of the child. In this light, States should expeditiously and completely cease the detention of children on the basis of their immigration status. 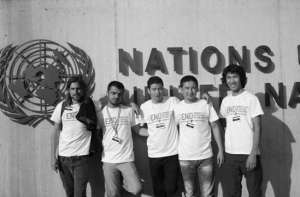 Six formerly detained children participated in a side event during the UN CRC’s Day of General Discussion. They shared their experiences of what it is like as a child subjected to immigration detention. The Deputy Commissioner for Human Rights and the Chairperson of the CRC both committed to further pushing this issue at the Human Rights Council. Since this, the campaign has focused on how to make the most out of the CRC Committee’s strong recommendation to “expeditiously and completely” end child immigration detention. Through our website – www.endchilddetention.org – we are tracking progress on this issue, while providing tools and resources for individuals and organisations to take action in their own communities. The campaign is an ongoing initiative and we are working with our many partners and supporters such as Caritas Internationalis to connect and share resources relating to child detention. We believe that by amplifying our voice, and the voice of detained children, we can and will end child immigration detention. I urge you to be one of the many supporters of detained children. Join us in seeking alternatives to child immigration detention and in protecting vulnerable child migrants, a demographic that is often overlooked. The campaign is free to endorse, and all our resources are available online for the public to use.